The episodes of the infamous Halliburton scandal have just taken a new sudden twist as the wife of Nigeria President, Aisha Buhari takes new desperate measures to cover her alleged dirty tracks in the scandal that has already severely dented the image of most Nigerian elite politicians both locally and internationally. Barely two months after Ekiti state governor, Ayodele Fayose exposed the involvement President Muhammadu Buhari's wife in the scandal with veritable documented evidences, and also dared her to step her foot in the United States of America to prove her innocence, Nigerians were however thrown into a state confusion when a pirate media outlet based in the US known as Sahara Reporters had on Thursday, published some pictures which it allegedly claimed were recently taken in Washington DC during a visit of the Nigerian First Lady. "As I am talking to you, there is no atom of Aisha Buhari over here in the United States. If anything of such had taken place, I will be the first to tell you because I am very close to most of the APC party members based here in the US. I am even surprised that Sahara Reporters would invent such a hilarious lie to deceive gullible Nigerians, I wonder how much Aisha paid them for the stunt" the source said on condition of anonymity. "The said picture doesnt even look like one taken at any of the airports in US" he continued. "If it were true that Aisha Buhari stepped her foot into this country, trust me the pictures of her with Michelle Obama or any US official could have gone viral in the internet because I know what my APC friends can do. "Or are they trying to tell us that she sneaked into this country? If that is the case, then she has a hand in the Halliburton scandal because a clear conscience fears no accusation" he concluded. The Nigerian government earlier dissociated the President's wife from the Halliburton scandal, claiming that the particular Aisha Buhari named in the scandal is based in the US and not in any way related to President Buhari's wife. Nevertheless, the US based Aisha Buhari in an interview with The Street Journal unequivocally rebuffed the allegations against her claiming that the Nigerian First Lady is desperate to masquerade her fraudulent activities. "They are desperate to cover their dirty track and link my name to the scandal that they have to first of all steal my passport. "If they think they are politician and can break the law and go free, they should realise that nobody is above the laws of a country including me." she said refering to President Buhari's wife. This picture and the visit of Nigeria’s First Lady to U.S. is suspicious. 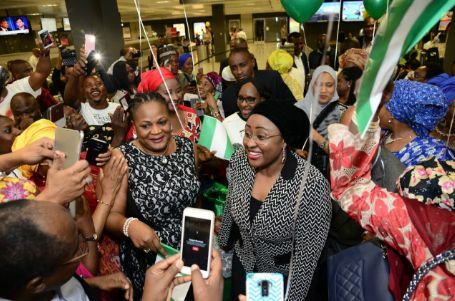 If Aisha Buhari did not visit the U.S. and this story and photo are concocted and fake, it means that Gov. Fayose's accusation of her involvement in Haliburton scandal is true. This people are shameless and fake human beings. I hope you guys would be Man enough and also apologise if and when flood of undeniable proofs start coming in. Plus you should by then disown your 'reliable source in the US', that is if he ever existed in the first place and not just a mere convoluted imagination of a lazy writer. Hold on, why not invest your time in the next story- AISHA WASTING TAXPAYERS MONEY IN US. You people should make use of your brains please. This news is trash. hmmmmm, the presidents wife could be a rouge yet the man is disturbing everybody making the widest noise. he should start with the wife instead. this old men are shameless.